If you've hit your retirement years, then you should be thinking about generating reliable income. Here are three stocks that have you covered. Creating income becomes more important once you retire. 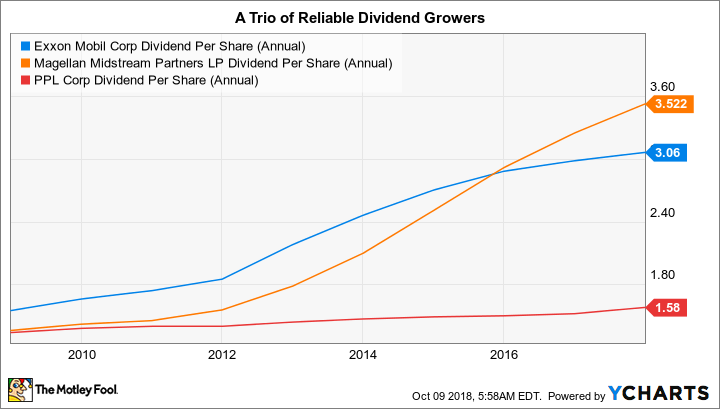 But you don't want to only reach for yield -- instead, you should be focused on companies that can provide a reliable, and hopefully growing, stream of dividends. Magellan Midstream Partners, L.P. (NYSE:MMP), PPL Corporation (NYSE:PPL), and ExxonMobil Corporation (NYSE:XOM) are all high-yielding dividend payers with long histories of increasing their dividends on a regular basis. If you are retired, you should consider these three stocks today. Midstream master limited partnership Magellan offers a distribution yield of 5.5%. It has increased that distribution for 18 consecutive years. The average annual increase over the past decade was 10%, over three times the historical rate of inflation growth. These are impressive numbers, and they don't even tell the whole story. Magellan has long been one of the most conservative midstream partnerships, focusing on self-funding as much of its growth as it can to avoid dilutive unit sales -- a model which peer and industry bellwether Enterprise Products Partners L.P. is starting to mimic. At the same time, Magellan has used leverage sparingly, with debt to EBITDA at the low end of the industry. This conservative approach, however, doesn't mean the company is skimping on growth. Magellan currently has $2.5 billion in growth projects in the works between 2018 and 2020 that should push distributions higher by as much as 8% a year over that span. And, true to its conservative approach, most of its capital spending is backed by customer commitments, or being made at facilities where demand clearly demonstrates a need for expansion. Globally diversified electric utility PPL, with assets in the United States and the United Kingdom, yields around 5.4%. That's toward the high end of the utility sector, and the dividend has been increased each year for 17 consecutive years. Although the average annualized increase over the past decade is only around 3%, that's enough to keep pace with inflation and, thus, protect shareholders' purchasing power. One key story here is PPL's heavy reliance on carbon-based fuels to generate electricity: In 2017, for example, coal accounted for 85% of the electricity PPL generated. That's a bad thing for the environment, but could be a good thing for PPL, which plans to reduce its carbon emissions by 70% by 2050. That's going to require a lot of spending on capital investments. In fact, the utility plans to spend roughly $15 billion through 2022 alone. Utilities are granted monopolies in exchange for government regulation of the rates they charge customers. In order to get rate hikes approved, utilities generally invest in upgrading their infrastructure. That's exactly what PPL needs to do if it is going to reduce its carbon footprint as planned. And this type of spending is generally looked at favorably today. That provides a solid backdrop to the company's projection of annual earnings growth of as much as 6% and continued dividend growth over time. The dividend growth will likely remain around the inflation rate, but with such a high starting yield that's not a bad thing. 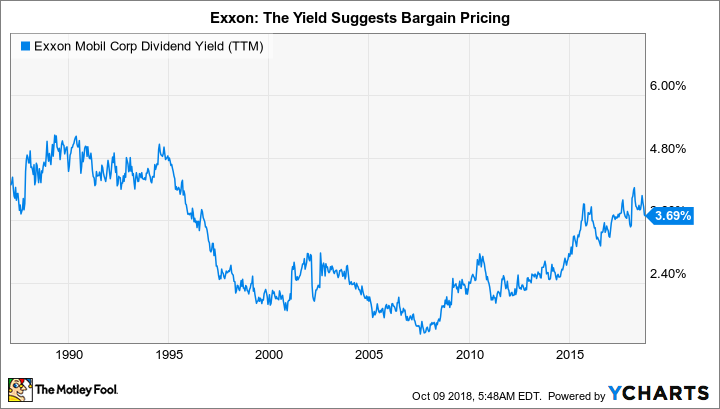 Exxon falls a little short on dividend yield compared to Magellan and PPL, offering investors a roughly 3.8% yield today. In fact, it isn't even the highest yielding integrated oil major. But it easily has the most impressive record of consecutive annual dividend increases at 36 years. That's pretty incredible given the highly volatile nature of the energy industry and shows a clear commitment to rewarding shareholders that peers can't match. The annualized increase over the past decade was roughly 8%. Exxon is actually pretty cheap today. The yield hasn't been as high as it's been lately since the late 1990s. There's good reasons for that, including falling production and middling returns on capital employed. However, Exxon remains one of the least leveraged oil majors -- long-term debt is less than 10% of its capital structure -- and it has plans in place to turn the ship around, notably spending on new production. That said, a ship as large as Exxon doesn't turn quickly. So it could take some time for the company's efforts to show solid results. If you can think long-term, however, Exxon has the financial strength to see its plans through even if oil prices plummet again. Magellan, PPL, and Exxon all offer market-beating yields backed by long histories of regular annual increases. More importantly, each of these companies has reasonable plans to keep its streak alive. If you are looking for dividend income in retirement, you should take a closer look at each of these companies today.